As if there weren’t enough other reasons to love Trader Joe’s, I sometimes make the 40-minute drive solely for its fresh pea shoots. They’re the perfect salad topper, sandwich stuffer or even soup garnish, and with their bright green color and crunchy bite, they just sing spring. A recent trip to feed my pea shoot addiction also resulted in a bag of some of the most gorgeous rainbow carrots I’ve ever seen, and the idea for this soup was born. Served chilled because the temperatures are warming up (finally! ), with a few dollops of pesto, this soup is bright and springy with the creamy comfort of carrots in each spoonful. 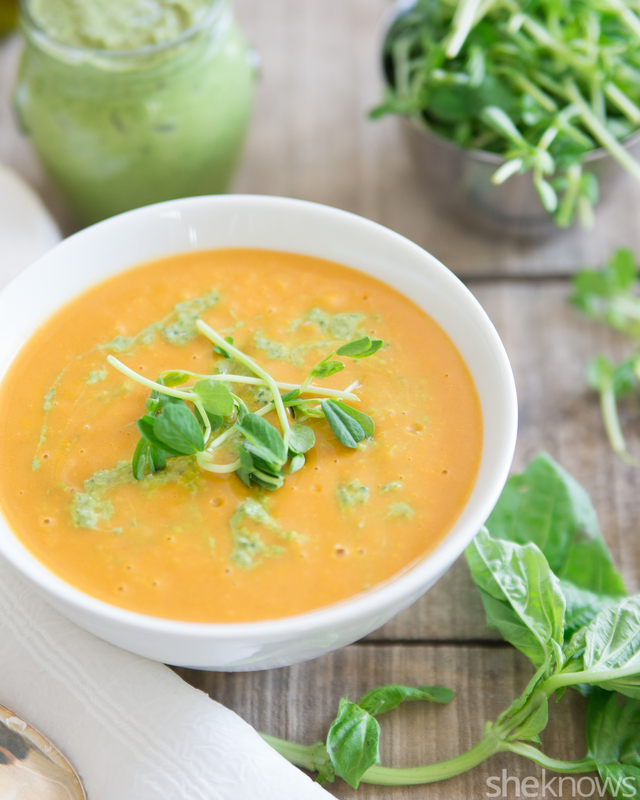 This chilled soup combines the freshness of spring peas with the creamy comfort of carrots. To a large saucepot over medium heat, add the oil. Add the onions, ginger and garlic, and sauté for 5 minutes, until softened but not yet brown. Add the carrots and broth, and bring to a simmer. Cook for about 20 minutes, until the carrots are fork tender. Transfer to a blender, and puree until smooth. Pour the mixture into a large bowl, add the lime zest, lime juice, yogurt, salt and pepper, and stir until combined. While the soup chills, make the pesto by combining all the ingredients except the olive oil and water in a food processor. Process until finely chopped. Scrape down the sides, and with the processor running, add the olive oil. Scrape down the sides again, and pour in water (about 2 to 3 tablespoons) until the desired consistency is reached. 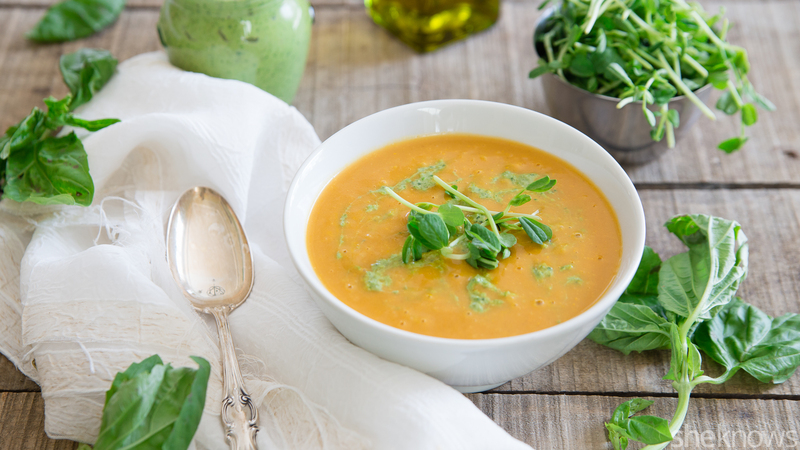 Pour the soup into servings bowls, drizzle the pesto on top, and garnish with pea shoots.